(Nanowerk News) Excitons could revolutionize the way engineers approach electronics. A team of École polytechnique fédérale de Lausanne (EPFL) researchers has created a new type of transistor – one of the components of circuits – using these particles instead of electrons. What is remarkable is that their exciton-based transistor functions effectively at room temperature, a hitherto insurmountable obstacle. They achieved this by using two 2D materials as semiconductors. Their study, which was published today in Nature, has numerous implications in the field of excitonics, one of the most promising new areas of study alongside photonics and spintronics. Since the electron is negatively charged and the hole is positively charged, the two particles remain bound by an electrostatic force. This bond between the electron and the hole is called Coulomb attraction. And it is in this state of tension and balance that they form an exciton. When the electron finally falls back into the hole, it emits a photon. And with that, the exciton ceases to exist. Put more simply, a photon goes in at one end of the circuit and comes out the other; while inside, it gives rise to an exciton that acts like a particle. It is only recently that researchers have begun looking at the properties of excitons in the context of electronic circuits. The energy in excitons had always been considered too fragile and the excitons’ life span too short to be of any real interest in this domain. In addition, excitons could only be produced and controlled in circuits at extremely low temperatures (around –173°C). The breakthrough came when the EPFL researchers (Dmitrii Unuchek, Alberto Ciarrocchi, Ahmet Avsar and Andras Kis) discovered how to control the life span of the excitons and how to move them around. They did this by using two 2D materials: tungsten diselenide (WSe2) and molybdenum disulfide (MoS2). “The excitons in these materials exhibit a particularly strong electrostatic bond and, even more importantly, they are not quickly destroyed at room temperature,” explains Kis. The researchers were also able to significantly lengthen the excitons’ life span by using the fact that the electrons always found their way to the MoS2 while the holes always ended up in the WSe2. 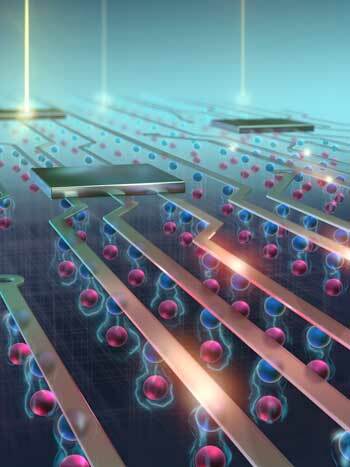 And, working with two Japanese researchers (Takashi Taniguchi and Kenji Watanabe), they kept the excitons going even longer by protecting the semiconductor layers with boron nitride (BN).